On 15 April 2009, the prestigious Beckman Center—the West Coast Headquarters of the United States National Academies of Sciences and Engineering in California—hosted an international conference that redefined the economic prospect for the Pacific Island Nations. Organized by PANGEA WORLD, in coordination with the UNESCO Office for the Pacific States, this conference charted a course towards empowering the island nations to shift away from aid/donations towards high-quality investments in building an exemplary sustainable economy that both nurtures and is nurtured by their collective heritage bounty. It celebrated the value of the Pacific’s trove of knowledge-rich natural capital as the principal untapped reserve of competitiveness and prosperity of the nations of this oceanic region. It underscored that the Academies’ West Coast Center, the University of California (UC) with the sprawling UC Irvine campus—one of the top comprehensive research universities in the world—with an array of powerful academic resources, combined with cutting-edge business assets and formidable investment capacity, are the cornerstones of California’s potential to thrive in this new era of knowledge economies. And it boldly bridged a call for a vanguard alliance that could prove to be world-changing, with a revolutionary impact on the economy, on conservation, and on science. 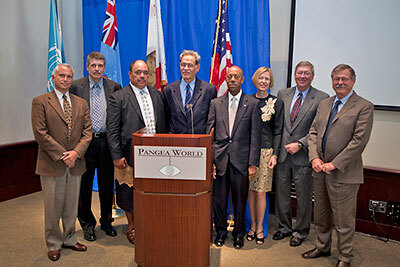 The formal launch of the UNESCO Pacific – PANGEA WORLD Partnership culminated this international gathering and inauguration of The Pacific Bridge to Noble Wealth. None of us knows what the future holds. But what we do know is this: Combining the best faculty, California’s top students, and our supportive community with other regions such as the Pacific Island Region guarantees success in the future. …a visionary combination of science and entrepreneurship…[it] offers a sustainable approach to the future. The concept of Pangea World is fresh and exciting. It is hoped that the “construction” of this knowledge-welded noble bridge will profoundly change the economic outlook for heritage-affluent countries and, in the process, engender a new-generation hospitality industry that extends the notion of luxury to lavish intellectual treats. A related aspiration is to shape this endeavor into an inspiration for economically-savvy science and conservation collaborations among nations, corporations, and institutions that may not count as strategic partners in the existing scenarios of international trade. On 23 July 2010, Pangea World held an invited event at the gathering of Pacific Island Nations Leaders in Fiji. The event, which took place at the InterContinental Fiji Golf Resort and Spa at Natadola, marked the regional unveiling of the pilot “Pacific Bridge to Noble Wealth” and culminated in a special announcement. Fiji’s President Ratu Epeli Nailatikau agreed to join this Pacific-spanning initiative as the Chair and Coordinator for the Pacific Island States. Following the groundbreaking presentations by Dr. Ayala and Dr. Clegg at Natadola in Fiji on July 23rd 2010, I accepted the invitation to become Chair of the initiative to extend The Pacific Bridge to Noble Wealth right across the entire region of the Pacific Island nations. The regional leaders at that meeting honored me with their support. I accepted this role in the very strong belief that this initiative can transform our region into an economic powerhouse…The Pangea World development concept provides a great opportunity for close partnership and networking involving investors, developers, planners, the scientific community, economic, corporate, and government entities and also amongst nations in working towards sustainable development goals. event in New York on 19 September 2010.